There are two types of waste adjustments. 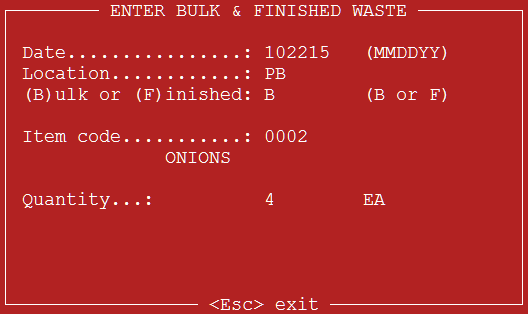 Bulk waste adjusts a single inventory item such as onions or beef. Finished waste adjusts items within a recipe such as hamburgers or soup. Retail adjustments typically are done under Miscellaneous postings but can be done under Waste Adjustments if you so wish. 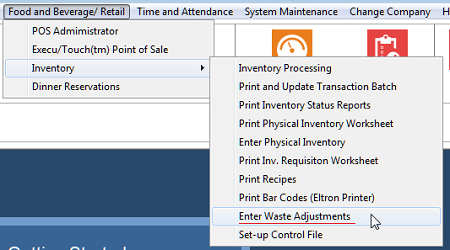 Go to Inventory Control > Enter Waste Adjustments. A red screen will open. You will be able to enter the information quickly. Date: Enter the date in MMDDYY format. Press Enter. Location: Enter the location of the waste. Press Enter. 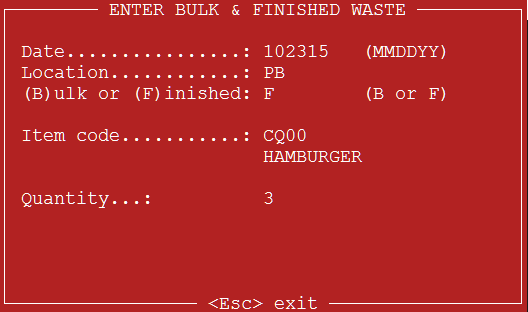 (B)ulk or (F)inished: Type B for bulk waste (such as onions); enter F for finished waste (such as hamburgers). For retail items enter B. Press Enter. Item code: For Bulk waste, enter the inventory item code. Press Enter. Quantity: Enter the quantity to adjust. Press Enter. The cursor will return to the item code field so that you can enter the next item. To change locations, press the up-arrow on your keyboard. When you are finished, press Esc on your keyboard. Below is the item detail display after the waste adjustment. Finished Waste is similar. Instead of the inventory item code, you will enter the POS item code. The recipe must exist for the POS item. Below is the batch printout for the waste adjustment. Note that the two inventory items for the POS item (HAMBURGER) have been adjusted.